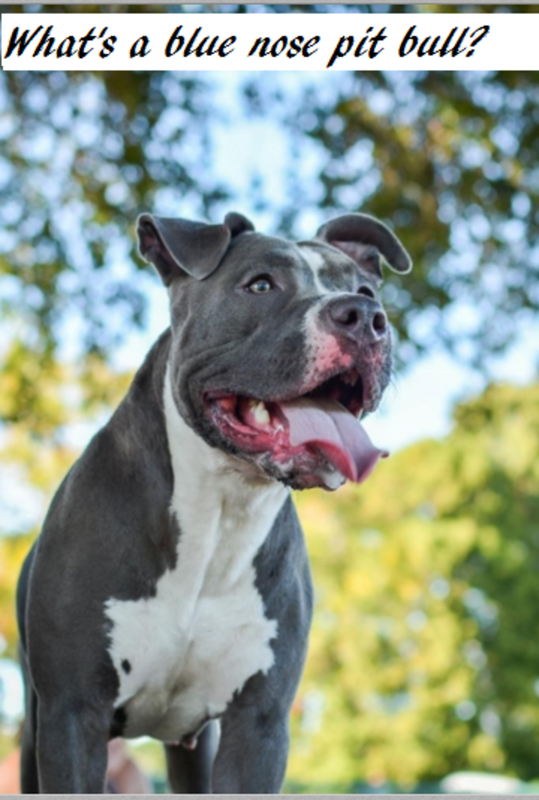 What is a blue nose pit bull? A) A very valuable dog. D) The product of an astute marketing strategy. The correct answer is: D. A blue-nosed pit bull is the product of a marketing ploy carried out by astute breeders. First, What is a Pit Bull? The word “pit bull” is really very generic and quite vague. It can mean different things depending on who you ask! 1. To the average Joe, a pit bull can be any dog with a square-shaped head and a bulky body, which can turn out being problematic especially when journalists report bite incidents causing the average mutts or other dog breeds to be mislabeled, promulgating the “pit bull” bad rap. 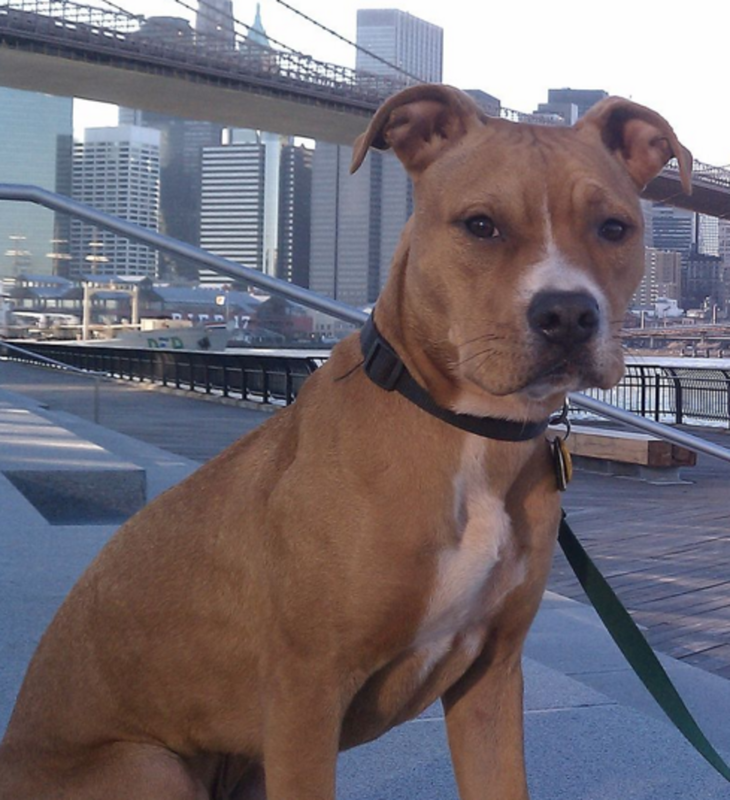 Even experts at times have a hard time distinguishing different dog breeds from a pit bull. See how you score on this “find the pit bull” test. Don’t feel bad if you get it wrong; many people require several attempts to get it right! 2. On the other hand, according to the Pit Bull Rescue Central, the term “pit bull” is used to define one of three different dogs: the American Pit Bull Terrier (APBT), the American Staffordshire Terrier (AST) and the Staffordshire Bull Terrier (SBT). If things weren’t confusing enough, these three dogs are quite similar (they all originated from the same group of British dogs) with only slight differences in size. Even experts at times have a hard time distinguishing one from another. While these are technically, the same dogs, they have been bred for different purposes, but according to Bobbie Morehouse, member of the National American Pit Bull Terrier Association, despite sharing a common ancestry, the American Staffordshire Terrier has a smaller gene pool and therefore has more consistent looks; whereas, the American Pit Bull Terrier tends to vary more in size and appearance. 3. Finally, the Pit bulls Without Misinformation states that the only true pit bull is the American Pit Bull terrier because it’s the only breed that contains the word “pit bull” in it. Just like chow chow are called chows, doberman pinshers are called Doberman and Labradors retrievers are called Labs, American Pit Bull Terrier are known by their “Pit Bull” nickname. So what is a blue nose pit bull? We know that the average color of the nose in most dog breeds is black, but in the blue-nosed pit bull as the name implies, the color of the nose’s leather (skin) is blue. A blue nose pit bull tends to have what is called “a blue coat.” Of course, these blues are not the type of electric blue or sky blue one thinks of when thinking about the blue color. In the dog world, it’s more like a grey color ranging from light silvery to deep charcoal. When it comes to the blue coat color in dogs, it’s the result of a dilution of the color black. In order to attain a puppy with a blue coat and it’s associated blue nose, each parent must be carriers of the recessive dilution gene. This means that breeders must use a narrow gene pools of dogs, often crossing dogs who are closely related genetically (inbreeding). It’s therefore very important to get these dogs from a breeder who knows what he’s doing to prevent genetic disorders. On top of that, blue coats have been found to be more prone to skin problems. Because of this, some breeders are starting to put warnings about these implications associated with diluted coats on their websites. Did you know? According to Coat Color Genetics, it’s genetically impossible for a blue dog to have a brown nose. Having a blue nose is not an indicator of belonging to any rare lineage and it is not it a sign of belonging to a different type of purebred pit bull breed. There are many pit bulls with noses of this color. If they were truly rare, there wouldn’t be so many breeders advertising them! For the most part, the belief that blue nose pit bulls are rare derives from unscrupulous breeders attempting to make their blue-nosed dogs appear as valuable so they can ask premium prices for them. According to The Real Pit bull website, breeders therefore only focus on producing the “special” blue coat color with the “rare” blue nose with little to no consideration to health and temperament. Of course, not all breeders of blue nose pit bull are crooks. To the contrary, there are breeders of blue noses producing specimens that are healthy and with stable temperaments, but the take home message though is that a dog’s temperament and health should always be considered much more important than coat or nose color. Did you know? Due to the high demand of blue-nosed pit bulls, the term “Blue Lust” was coined over the past few years. How much does a bluenose pit bull cost? 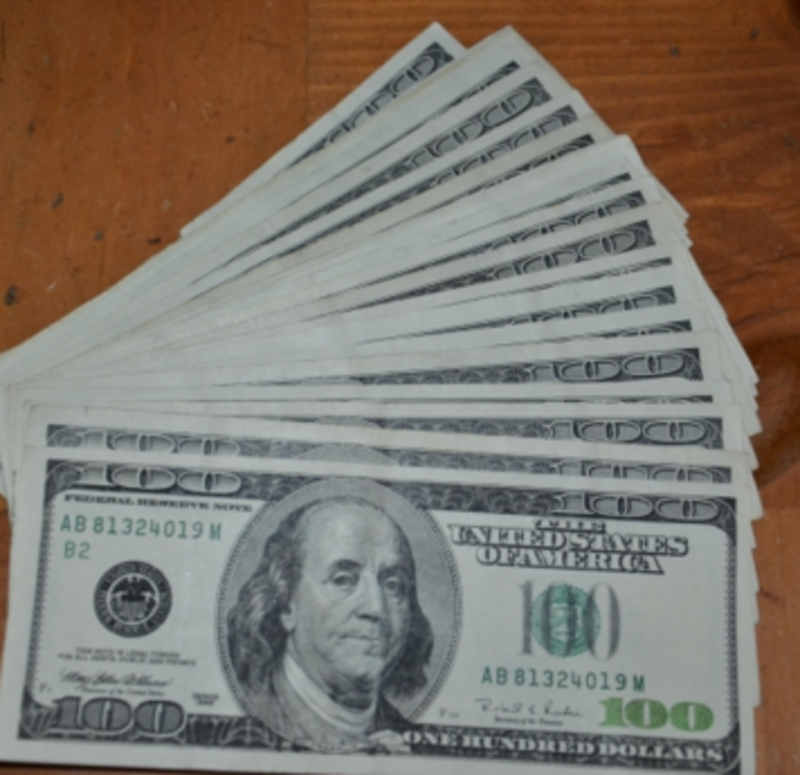 Generally, the price of blue nose pit bulls ranges between 1,000 to 3,000 dollars and even more! Here is where things get extra confusing! Breeders eager to make fast money started at some point crossing American Staffordshire Terriers with American pit bull terriers in hopes of obtaining a “rare” blue coat color that wasn’t seen before. Because there was likely some mastiff blood in the American Staffordshire Terrier, a silvery-grey coat pattern at some point popped up. Since as mentioned, the American staffordshire terrier and the American pit bull terrier are quite similar, the money making strategy worked for these breeders. So if you stumble on blue “pit bulls” that have exaggerated features such as wide chest, heavy bone structure, massive bulky body and a blocky head, likely it’s an American bully. This breed is basically, an American Pitbull Terrier with its own standard. To quote the United Kennel Club, “Their appearance reflects a strong American Pit Bull Terrier foundation, blended with stock from other bull breeds.” The Real Pitbull website, refers to these dogs as “essentially an American Pit Bull Terrier that is poorly bred” and advocates those searching for a pit bull to avoid American Bully breeders, as ethical breeders should work on preserving the American pit bull terrier breed instead of making their own distorted versions of it. 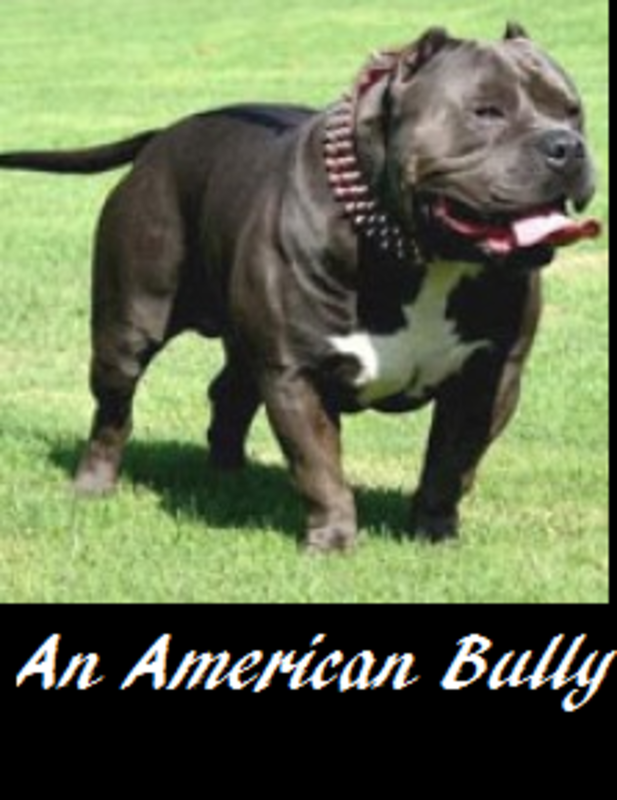 “The problem is that there is no concerted or organized effort to actually turn the American Bully into a real breed, nor a full attempt to separate the American Bully from the American Pit Bull Terrier. The lines are so blurred as to be invisible at times.” ~The Real Pitbull. As seen, blue nosed dogs are not a special “type” of purebred pit bulls nor do they belong to a special lineage of pit bulls. They just happen to be dogs who have a different color of nose compared to other pit bulls. Just as one wouldn’t say “I have a brindle pit bull” saying “I have a blue nose pit” doesn’t really mean anything special other than providing a description. This is no different than people being described as having blond or dark brown hair. However, just because blue nose pit bulls aren’t a special or rare type of pit bull, doesn’t make these dogs less special! Just like snow flakes, each dog comes with its own distinct personality and each dog is special in its own way. Blue-nosed, red-nosed or any other colored-nose, these dogs are as special and lovable as they can be! Did you know? 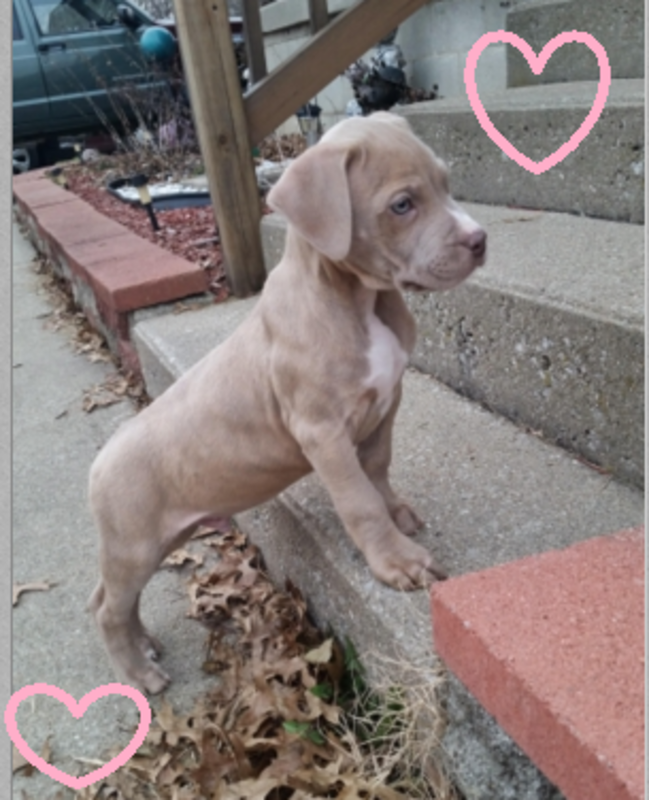 A few red nose pits come from the Old Family Red Nose bloodline featuring American Pit Bull terriers with amber-eyes, red-noses, red lips, red toe nails and red coats. Just because a pit bull has a red nose though doesn’t mean that it comes from this distinct line. Heading Home K9 Rescue, Pit Bulls, A Guide, retrieved from the web on April 19th, 2016. The Real Pit Bull, Bully: this, that and the other thing, retrieved from the web on April 19th, 2016. The Proper Pit Bull, What You Need to Know About Blue Pitbulls and Blue Nose Pitbulls, retrieved from the web on April 19th, 2016. United Kennel Club, American Bully, retrieved from the web on April 19th, 2016.